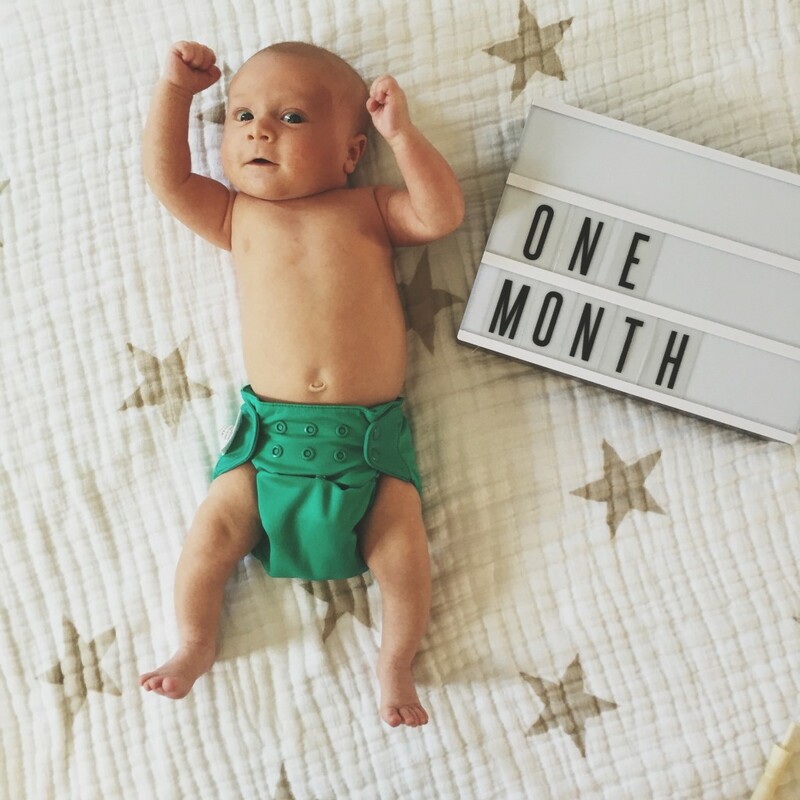 Malachi is one month old! Technically one month and 5 days. We call him Mellowchi because he’s so relaxed and easygoing. 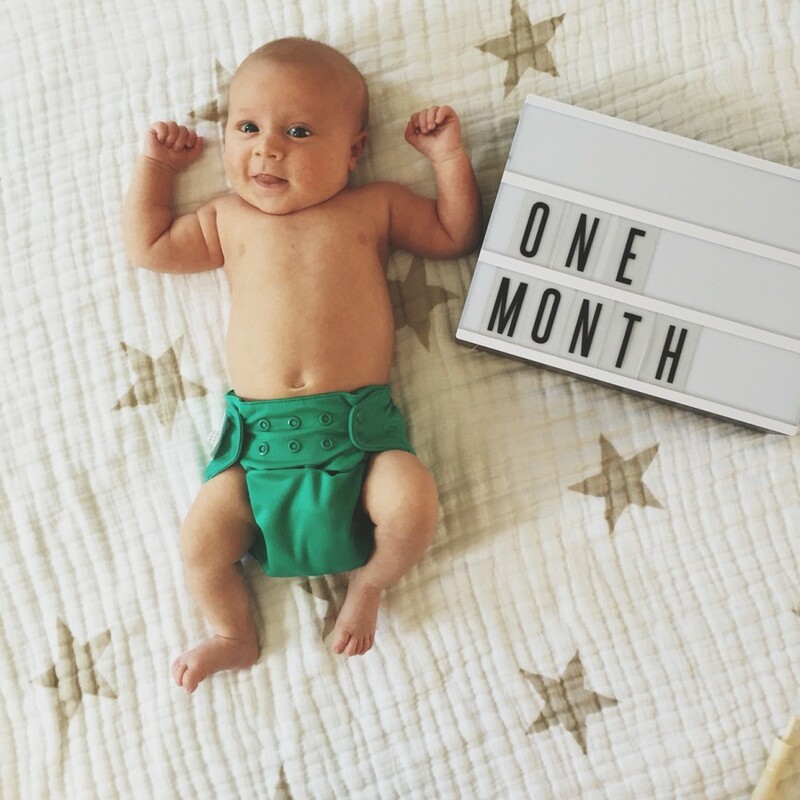 Sometimes we call him Mr. Chunkerton because he’s in the 97th percentile in both height and weight at almost 12 pounds and 23″ (Up from 8lb8oz and 21″ at birth). He’s holding his own head, looking side to side and pushes up to an almost full upward-facing dog during tummy time. He loves to be close to mama while being worn in the ring sling and sleeps most of the night. So far, he’s only 100% polar opposite of Jude, except he’s just as cute. His jaundice issues are all cleared after an unpleasant first two weeks of life battling high bilirubin, peaking at a whopping level 25. Between nearly 48 hours of being under the lights at the hospital and spending another week in a Biliblanket in our home, his levels finally came down to a tolerable range and we are setting into our new routine as a family of four, loving each moment. Dislikes: the hours 9pm-11pm; those are designated fuss times where he can only be soothed by nursing and being held. Candy Kirby Designs cotton gown – the simplest way to dress for daytime, making diaper changes as painless for all as possible. And super cute. Earth Mama Angel Baby · New Mama Bottom Spray – delivery was, in relative terms, a breeze, and mama is healing nicely. This spray is helpful and smells lovely. I used it postpartum with Jude also and it reminds me of being a brand new mama and that special time. It’s utterly freezing today in NE Ohio and even though it’s March, we are in the middle of one of the seemingly worst storms yet this winter. It’s a complete white-out. I decided to make some traditional comfort food (read: a hearty Italian meal) for dinner. 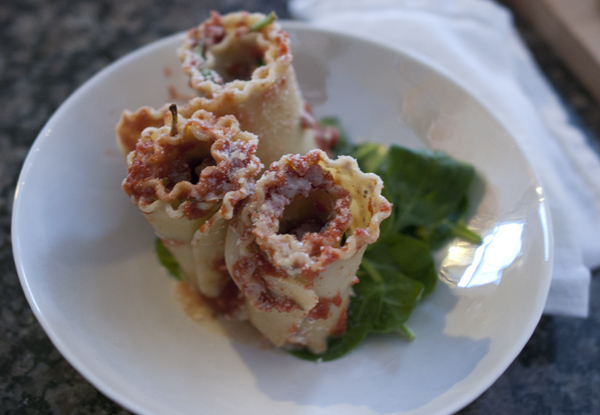 I have never made any type of lasagna rollup before, but put this recipe together as I went and it did not disappoint. Perfect warm meal to enjoy with a glass of red while watching the snow fall with all my boys. Enjoy! 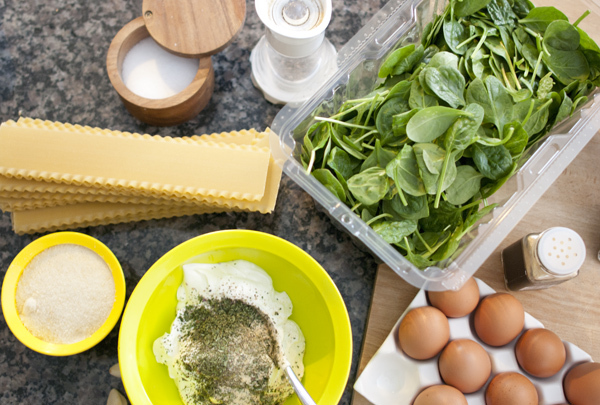 Set a pot of water to begin boiling and preheat the oven to 350º. 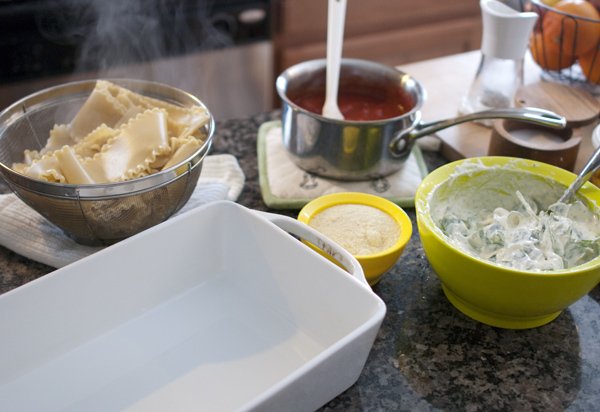 Once water begins to boil, place lasagna noodles in and cook until tender but not too soft. In a small saucepan, heat the can of crushed tomatoes until warm. Add the sugar to cut acidity, if desired. Add freshly pressed garlic to this tomato mixture. 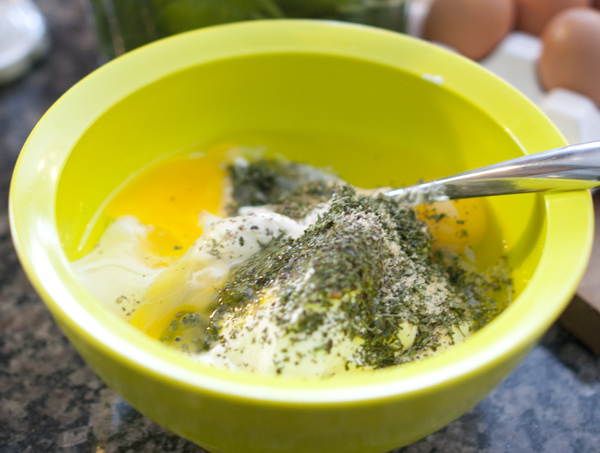 Combine sour cream, cup of grated parmesan, 3 eggs, spices, salt, pepper in a mixing bowl. 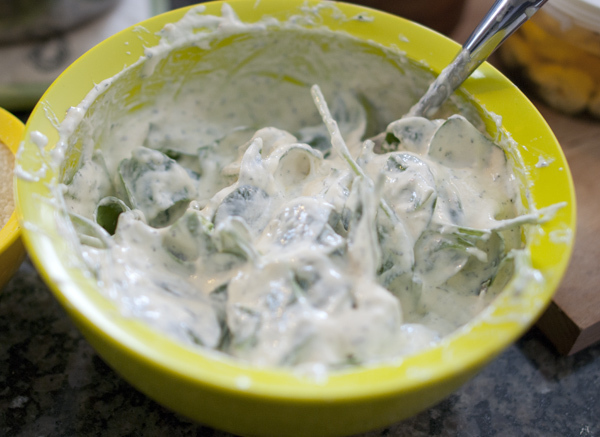 Once stirred completely, add the fresh spinach one handful at a time, until all leaves are covered in the mixture. 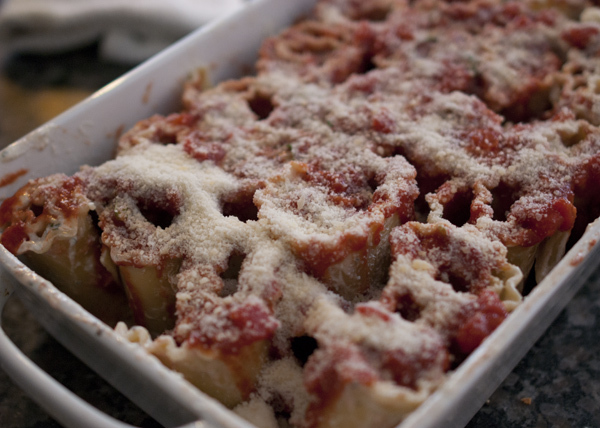 In a 9×13 baking dish, spread a bit of the tomato mixture on the bottom of the dish. Once the noodles are tender, lay them flat and smear a small amount of the sour cream mixture onto the flat noodle – like you’re buttering a slice of toast. 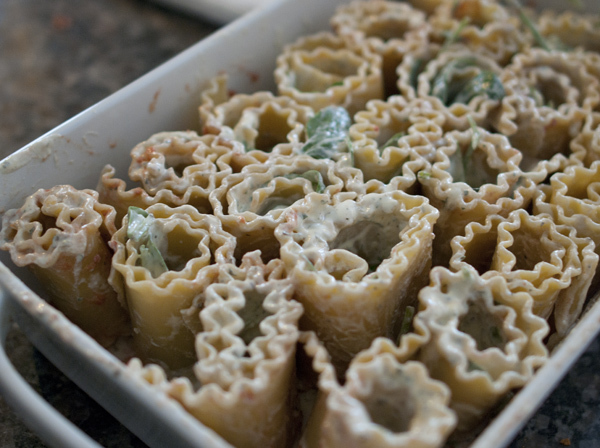 Then roll up the noodle and place on its side in the baking dish. Continue until all noodles & baking sheet are filled. Top with remaining tomato mixture and sprinkle on any additional parmesan cheese. Bake for 15 mins covered with foil.